Sounds familiar to you? You might have heard it from somewhere or seen the online advertisement when you are browsing online. Or probably you have read about my staying experience in Trizara Resorts with my friends that I posted a few years back. 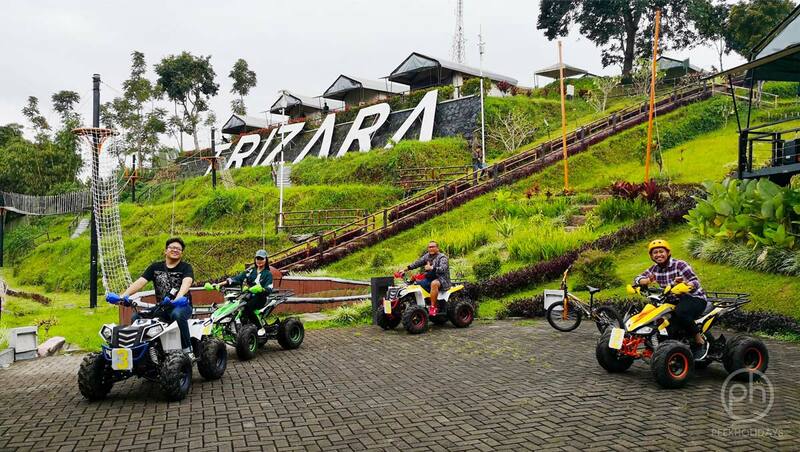 Trizara Resorts is a glamorous camping (glamping) resort located at the Peak of Lembang. With its slogan, “Be One With Nature”, they aim to be a place for people to enjoy the nature without having to compromise their comfort. Camping should be an enjoyable experience for everyone. If the usual camping experience is too rough, then, this should be a go for you. FUN. Another word to add on top of what Trizara Resorts has already known for – comfortable, beautiful, relaxing, and refreshing. Some people said it is great because it was my first time staying at Trizara Resorts. However, after multiple times staying there and the feeling is still the same, do you need to question further? While many of us enjoy the serenity staying in Trizara Resorts, however, sometimes our wilder side screams out of sudden. And if that happens, don’t worry! Now, Trizara Resorts has few ways to let you vent it out with their latest addition of activities in the resort. Let’s see what those new activities are! For those who have never tried this before, ATV or all-terrain-vehicle is a four-wheeler (or more) vehicle. As the name implies, it is designed to handle a wider variety of terrain than most other vehicles. My first ATV ride was in Batam. Surely it wasn’t a smooth one in the beginning but immediately I got hang of it after minutes. To me, I felt like I am riding on a motorbike with a body of a car. If you have worried about balancing, bad news – you have worried about something unnecessary. It’s a four-wheeler, remember? Enjoy 20 minutes ATV ride at only IDR 200,000,- Hop on it, and give it a try. Let’s see how good you can steer this four-wheeler! If that’s not challenging enough to feed your soul, there is a Flying Fox and High Rope course to go for! All I can say is, don’t underestimate the length and the height that may seem nothing to some people. Both flying fox and rope course in Trizara Resorts are run by the professional operator. So, free yourself and enjoy the game with peace of mind. Enjoy both Flying Fox and High Rope Course experiences at IDR175,000,- or IDR 75,000,- for Flying Fox experience only. This may not be new in Trizara Resorts. However, I urge you not to miss this! At first, I was in doubt to try this. I mean, I am not sure what am I suppose to do inside there? Jumping? Seriously, I had no idea. But luckily my friends are not like me – who tends to think too much sometimes. We had some fun jumping on the Trampoline and actually this is a form of exercise as well. My breath was taken away quite fast although we are actually bouncing effortlessly. Free. Enjoy it as long as you want without forgetting to share with other guests, too! Some insider’s tips: When you see the night sky is clear, come out from your tent and lay yourself down on this trampoline. Relax and look up to the sky and enjoy the starry night! But do note that there is a limit of people allowed to enter at the same time though. I am happy to see the progress going on in Trizara Resorts. I still remember the first time I was there with my friends, all was just started. The plants and the trees hadn’t grown that dense and tall yet that time. Now? All have grown beautifully around the resort under the care of their lovely staffs that never failed to give a big smile when I bumped into them. The breakfast served at their Indriya Cafe that time also had not much variety. Now? We are pampered with plenty of choices – complete from delicious starters to desserts. As a soup lover, I give a big thumb up for their soups and another thumb up for their restaurant staff’s hospitality. Many thanks to Trizara Resorts for holding a Travel Bloggers Reunion and inviting us – like always I’m keeping it real – all opinions are my own.